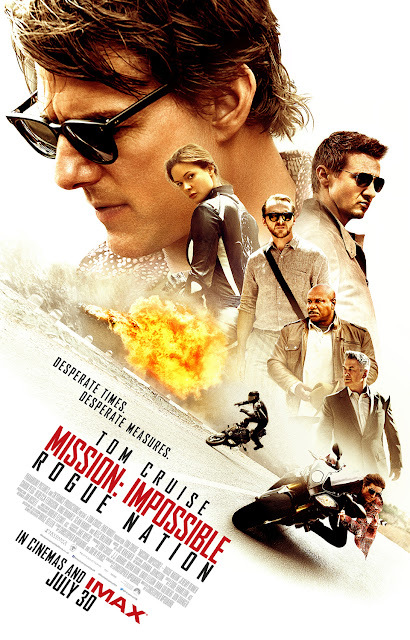 Film Review: "Mission: Impossible - Rogue Nation" (2015). The tagline "Go rogue" is exactly what Mission: Impossible – Rogue Nation goes for. This action spy film written and directed by Christopher McQuarrie. It is the fifth installment in the Mission: Impossible series. For their fifth mission, Ethan and team take on their most impossible mission yet, eradicating the Syndicate - an International rogue organization as highly skilled as they are, committed to destroying the IMF. Paramount Pictures announced in August 2013 that Christopher McQuarrie would direct the fifth Mission: Impossible film, from a script by Drew Pearce, with Tom Cruise reprising his role as Ethan Hunt. On November 14, 2013, Simon Pegg confirmed he would reprise his role as Benji. In May 2014, Will Staples replaced Pearce as screenwriter. Also that month, Jeremy Renner confirmed he was returning in the role of Brandt, and Cruise said the film would shoot in London, with a later report saying it would first shoot in Vienna in August. In July 2014, Rebecca Ferguson was cast. Alec Baldwin was confirmed to have joined the cast in August 2014, and Ving Rhames was confirmed to be reprising his role of Luther. On September 5, it was announced that Sean Harris was in negotiations for the villain role. On October 2, Simon McBurney joined the cast of the film. On March 22, 2015, Paramount revealed the film's official title Mission: Impossible – Rogue Nation, along with a teaser poster and trailer. Tom Cruise, reprises his role as IMF Agent Ethan Hunt. As well as Jeremy Renner as Brandt, Simon Pegg as Benji, Ving Rhames as Luther. In addition, the film stars Rebecca Ferguson, Sean Harris, Alec Baldwin and Simon McBurney. The veteran cast, as well as the new cast, gave amazing performances. With the veteran cast topping their performances from the previous films. But the real kudos goes to Cruise, who not only took his character even further but topped himself in terms of stunt performance. For the opening scene where Ethan Hunt climbs on the outside of a flying airplane (an Airbus A400M), Cruise performed the sequence without the use of special effects or a stunt double. At times he was suspended on the aircraft 5000 feet in the air (1.5 kilometres). Cruise stated in an interview that it was his intention was to do the stunt in a way to outdo himself after the Burj Khalifa climb stunt in the previous film. To capture the action, a wind-resistant custom frame for the camera was built and mounted onto the left wing of the plane. Eight takes of the stunt were filmed. McQuarrie was very concerned that the actor could panic out of the sudden but was assured by Cruise not to stop the filming each take until the stunt routine has been finished. On top of that, Cruise himself was injured six times during the making of the movie. So bravo Mr. Cruise! More Stylish, faster-paced, and loaded with more gripping set pieces, Mission: Impossible - Rogue Nation is another big-budget popcorn entertainment that really works. The eye-candy—from high-tech gadgets to gorgeous people—has only been ratcheted up even more. With each film it gets more ludicrously improbable, but also more fun. It is faster and more explosive. McQuarrie passes his audition for a career as a modern action director. And the film more than makes its bones as an argument for why Tom Cruise should continue in this role as long as his knees, and his nerves, hold up. Also, see my review for Mission: Impossible - Ghost Protocol. "This July, heroes don't come any bigger." This is what Marvel Studios is bringing with Ant-Man. This superhero film based on the Marvel Comics characters of the same name. Produced by Marvel Studios and distributed by Walt Disney Studios Motion Pictures, it is the twelfth installment of the Marvel Cinematic Universe (MCU). The film was directed by Peyton Reed, with a screenplay by Edgar Wright & Joe Cornish and Adam McKay & Paul Rudd. Armed with the astonishing ability to shrink in scale but increase in strength, con-man Scott Lang must embrace his inner-hero and help his mentor, Dr. Hank Pym, protect the secret behind his spectacular Ant-Man suit from a new generation of towering threats. Against seemingly insurmountable obstacles, Pym and Lang must plan and pull off a heist that will save the world. 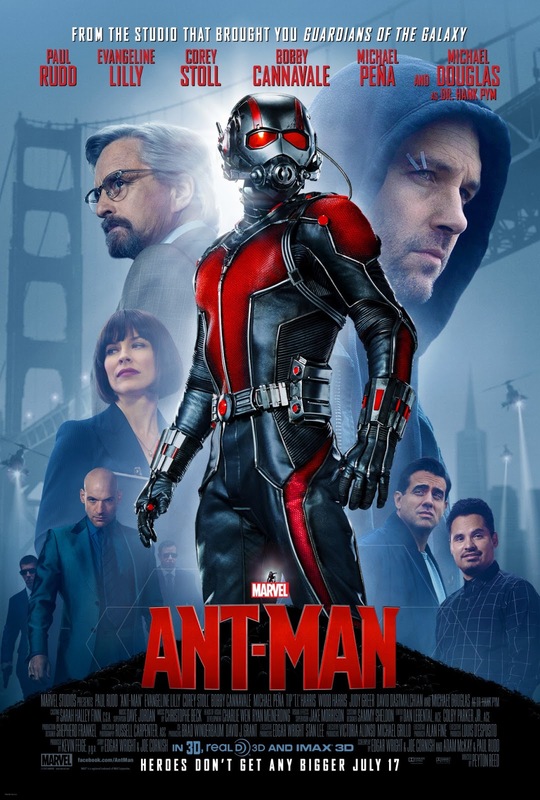 Development of Ant-Man began in April 2006, with the hiring of Wright to direct and co-write with Cornish. By April 2011, Wright and Cornish had completed three drafts of the script and Wright shot test footage for the film in July 2012. Pre-production began in October 2013 after being put on hold so that Wright could complete The World's End (2013). Casting began in December 2013, with the hiring of Rudd to play Lang. In May 2014, Wright left the project, citing creative differences, though he still received screenplay and story credits with Cornish, as well as an executive producer credit. The following month, Reed was brought in as Wright's replacement, while McKay was hired to contribute to the script with Rudd. Principal photography took place between August and December 2014 in San Francisco and Metro Atlanta. The film stars Paul Rudd, Evangeline Lilly, Corey Stoll, Bobby Cannavale, Michael Peña, Tip "T.I." Harris, Anthony Mackie, Wood Harris, Judy Greer, David Dastmalchian, and Michael Douglas. Despite the cast giving great performances, in particular Rudd, Peña and Douglas, they lacked a few important elements that made their seem too familiar. For instance, Stoll's portrayal of Darren Cross suffers from what the other Marvel villains lack: depth. He's presents the character as a typical two-dimensional villain that are often associated with early comic-book movies. In addition the chemistry between Rudd and Lilly was weak and lacked the connection that Iron Man and Pepper Potts have. Ant-Man provides the action and humour to please comic book fans and ignite this fledgling comic book character. What seemed, in theory, the least-necessary adaption of a lesser known superhero emerges as a perfectly solid summer action fare. It's all par-for-the-course cinematic heist, staged efficiently and with a hint of enthusiasm, and penned with sporadic wit. Visuals lean toward the light and poppy. The effects are in line with pic's generally pro and inspired achievements. However, the inevitable comparisons to Iron Man (2008) and the lament for Edgar Wright's bold and original take, Marvel Studios' second blockbuster this summer, serves as a glaring reminder of what this film lacks: true originality and vision. Despite the presence of Paul Rudd, an actor capable of unbelievable comedy chops, we don't feel a strong sense of Wright's humour that could have carried this film to cinematic greatness. Also, see my review for Avengers: Age of Ultron. Disney Diary - Week 28 (Final). Today marks the end of my Disney Diary entries for terrible circumstances have occurred. As of today, Wednesday July 22nd 2015, I have been terminated from the Disney International Programs. I have had a meeting with Disney and Disney Housing and I have been informed that I have been let go and that I have to leave the United States of America in 48 hours. This is an order sanctioned by the U.S. Government. The reason for my termination and sudden departure is that an incident occurred at work and, at the end, I was found relieved of my job. "I see... brilliant people rising from this abyss. I see the lives for which I lay down my life, peaceful, useful, prosperous and happy. I see that I hold a sanctuary in their hearts, and in the hearts of their descendants, generations hence. It is a far, far better thing that I do, than I have ever done; it is a far, far better rest that I go to, than I have ever known." I also express my Sorrows for the fact that I have let you all down and that I won't be seeing you for a while. Hopefully this won't be the case and that, in the not-so distant future, I will return to this amazing country and see you all again. To conclude my dear friends, I wish you all the best on your adventures, I will miss you all terribly and I bid you all farewell for now. Goodbye. "Sometimes you have friends in a relationship. You love each of them dearly as individuals and think they're amazing people. When they talk to you about their troubles, you do everything you can to support them, to keep them together, because if you love them both so much doesn't it make sense they should love each other? But little by little you realize, at heart, they aren't meant to be together - not because there's anything wrong with either of them, but they just don't have personalities that mesh in a comfortable way. They don't make each other happy. Although it's sad to see them split, when they do, you're surprisingly relieved, and excited to see where their lives take them next. It's easy to try to make one party "right" and another party "wrong" when a breakup happens, but it often isn't that simple. Or perhaps it's even simpler than that - not everyone belongs in a relationship together. It doesn't mean they're not wonderful people." And that's certainly true of my relationship with Disney. One of them isn't a person, but I think you get what I mean. 1. It's going to be hard work and it's not for everybody. And I cannot stress that enough! By the time you'll get back, you'll be happy to come home and appreciate what you have. Because from what I have experienced and deduced, the workforce in the U.S. is no laughing matter. So if you have the guts and/or the balls then by all means go for it. 2. The living environment is not what Disney advertises. What they say to you in their presentations is nothing but a sugarcoated lie. They do it in order to lure people in. Florida, especially Orlando, is advertised as a hotspot in the U.S. But it is not exactly the best place for people to live in. So definitely do your research if you so decide to take on this adventure. 3. The final point - make the most of it. Despite the two previous tips, this internship is going to be full of surprises. And that's great for a young person, especially when they are on a journey of self-discovery. During my adventures here I've had highs and lows, and I'm grateful for both. Because the lows have helped me develop a thick skin and have helped me shape a better understanding of the world. The lessons I have learnt have made me a world-weary person. I'm also grateful for the highs for I have made great connections and friends. And there you'll experience the same thing. So now I conclude this entry and let you decide whether or not to take a leap of faith and let yourselves decide whether or not Disney is the place for you. I trust you all will make the right decision. Disney Diary - Week 27. For this week, my roommates (Adrian, Cristian, Hermmann, Travis B and Travis C) and I had the same day off and decided to go to Fort Wilderness Lodge to eat at Trail's End. An all American Western-style buffet where you can grub on all-you-care-to-enjoy American favorites in a remote setting. You can round up the whole settlement and sail across Bay Lake to the time of pioneers and a place of natural splendor. Nestled on 750 wooded acres of lush pine and cypress trees inhabited by enchanting wildlife, this is one dining destination you’ll want to allow plenty of time to reach—getting there is a trailblazing adventure unto itself! Beamed ceilings, split-log walls, mounted animals and a potbellied stove keep things suitably cozy and rustic as you and your kin tuck into a heaping spread of hearty countrified fare and new-fangled favorites. Don't believe me? Check out the photos below. Welcome to Fort Wilderness Lodge! Trail's End and Crockett's Tavern. Here are two of my roommates: Travis B and Cristian. Here are Cristian and Travis B on their phones... again. After a nice big breakfast consisting of everything you could find in an American buffet, the guys and I had a fun time talking about all kinds of things. Right then and there, we really got to know each other better than we ever did. It was sad however that this time would be the last time we would hang out before we would all leave. One of the taglines for the film reads "Before Gru, they had a history of bad bosses", this is that story for Minions. This 3D computer-animated family comedy film produced by Illumination Entertainment and directed by Pierre Coffin and Kyle Balda. It is a prequel/spin-off to the Despicable Me franchise. 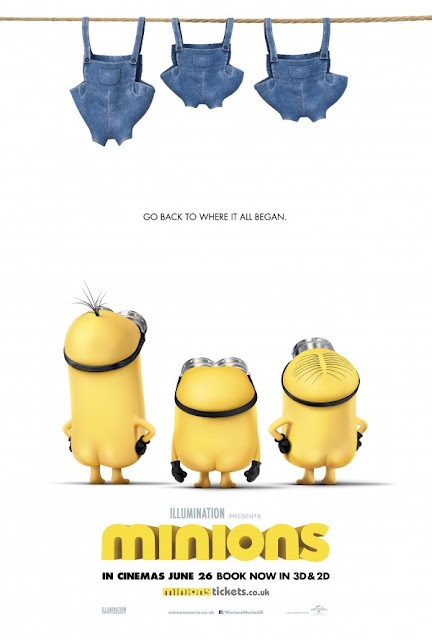 The film follows Minions, Stuart, Kevin and Bob, forty-two years B.G. (Before Gru) as they are recruited by Scarlet Overkill, a super-villain who, alongside her inventor husband Herb, hatches a plot to take over the world. The film was first foreshadowed in the ending credits of Despicable Me 2 (2013), where Stuart, Kevin, and Bob, three of the Minions, are seen auditioning for the film. In July 2012, Universal Studios and Illumination Entertainment announced that the Minions from Despicable Me (2010) would get their own spin-off film, and was planned for a 2014 release. On August 21, 2012, it was announced that the film would be released on December 19, 2014. In February 2013, Sandra Bullock joined the cast to voice Scarlet Overkill, with Jon Hamm joining two months later as her husband Herb Overkill. On September 20, 2013, the film's release date was pushed back from December 19, 2014 to July 10, 2015, due to Universal's satisfaction with the July release of Despicable Me 2 and desire to exploit fully the merchandising potential of a summer film. Upon hearing this, I couldn't be more intrigued and excited for this film. I thought "what could go wrong? It's a movie with the Minions!" The film stars Coffin (as the Minions), Sandra Bullock, Jon Hamm, Michael Keaton, Allison Janney, Steve Coogan, and Geoffrey Rush. The performances the cast gave in this film were just as hilarious and comical as the two Despicable Me films. But the true stars are the title characters. In every scene they steal the show with their adorable, lovable and comical flair. They are the reason that children and adults alike flock to the movie theaters and thus helps the films make a truck-load full of money. The most interesting and memorable thing about the minions themselves is their language. The language known as "Minionese" which is spoken by the minions is a mix between several languages including English, Spanish, French, Portuguese, Hebrew and Gibberish. Minions doesn't scale the heights of Despicable Me, but it is still funny family entertainment for viewers of any age. The film is true to the spirit of the previous films and matches its tone. But it never seems content to turn over old ground. Furthermore, it is cute, and funny, and the animation, though not exactly inspired, is certainly colorful. It might not be as gifted as some of its other movies, but sometimes it's alright to be ok. It's all infectious fun, despite the lack of originality. This minor film with major charms still deserves to have kids dragging their parents to the multiplex for one more peek at the minions. It is one of those movies that has absolutely no reason to exist, but once you've seen it, you're kind of glad it does. Also, see my review for Despicable Me 2. 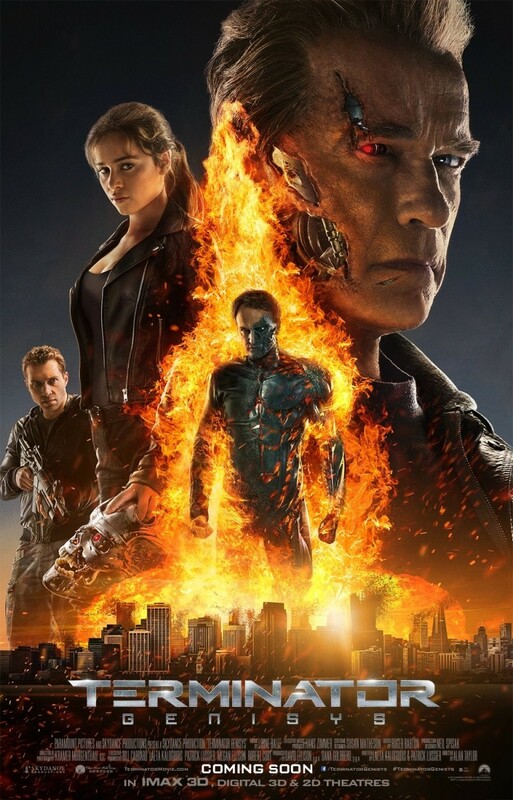 Film Review: "Terminator Genisys" (2015). "... The timeline John sent you to no longer exists. Everything's changed... and we can stop Judgement Day." This is the new mission set for Terminator Genisys. This science fiction action film directed by Alan Taylor and written by Laeta Kalogridisand Patrick Lussier, based on the characters created by James Cameron and Gale Anne Hurd. It is the fifth installment in the Terminator series, and acts as a retcon that alters the original story's timeline. John Connor sends Kyle Reese back in time to protect Sarah Connor, but when he arrives in 1984, nothing is as he expected it to be. While Terminator Salvation (2009) was initially intended to begin a new trilogy, production on a fifth film was put on pause as a result of legal issues and the Chapter 11bankruptcy filing by The Halcyon Company. By late September 2009, the rights to the franchise were once again up for sale as The Halcyon Company tried to emerge from bankruptcy. Late the following month, Halcyon announced it would auction off the rights to future Terminator material and was seeking $60 million to $70 million. On February 8, 2010, an auction was held for the Terminator rights. After studios Sony Pictures and Lions Gate Entertainment bid separately, Pacificor, the hedge fund that pushed Halcyon into bankruptcy, made a deal for $29.5 million. In May 2010, Pacificor hired an agency to sell off the rights to the franchise. By August 2010, a new Terminator film was being developed at Universal with Arnold Schwarzenegger returning in the title role, Justin Lin directing, and Chris Morgan as screenwriter. By May 2011, Megan Ellison and her production company Annapurna Pictures had won the rights at auction to make at least two more Terminator films, including Terminator 5. Now titled Terminator: Genesis, the film was to be produced by Megan and David Ellison of Skydance Productions. Laeta Kalorgridis and Patrick Lussier were commissioned to write the screenplay. But the film was left without a director as Justin Lin, who was originally in discussions to direct, chose to direct Fast & Furious 6 instead. By June 27, 2013, Paramount had pushed the film's release date back from June 26, 2015, to July 1, 2015. By September 2013, Alan Taylor was in talks to direct the film, after Ang Lee, Rian Johnson and Denis Villeneuve had been considered. During an interview, James Cameron, admitted that he had been asked to be involved in the film by Megan Ellison. Cameron later had held several meetings with David Ellison, where they discussed Schwarzenegger's role and how to stay true to the original T-800 character. After having watched the film's prerelease screening, Cameron unequivocally voiced his support for Terminator Genisys, characterizing it "as being extremely respectful of the first two movies" and counting it as the official third film in the franchise. The film stars Arnold Schwarzenegger, reprising his role as the eponymous character, along with Jason Clarke, Emilia Clarke, Jai Courtney, Lee Byung-hun, J. K. Simmons and Matt Smith. Despite the cast giving their all and their own interpretations of the iconic characters, they felt stale and out of sync. Schwarzenegger was the only one who played the role without any problems. Although Terminator Genisys never reaches the heights of the first two movies, it is a welcome addition to the Terminator franchise than the atrocious Terminator: Rise of the Machines (2003) and Terminator Salvation. However, the film feels thats it's essentially one long convoluted time-traveling plot, punctuated by mindless fights and action with comic, campy and simplistic dialogue. Also, see my review for Thor: The Dark World. Film Review: "Ted 2" (2015). The tagline of the film reads "Ted is coming, again", and that is the case for Ted 2. This comedy film directed by Seth MacFarlane and written by MacFarlane, Alec Sulkin, and Wellesley Wild. It is a sequel to the 2012 film Ted. The film follows Newlywed couple Ted and Tami-Lynn who want to have a baby, but in order to qualify to be a parent, Ted will have to prove he's a person in a court of law. During the 2012 American Dad! Comic-Con panel, MacFarlane stated that he would be open to a sequel to Ted. In September 2012, chief executive Steve Burke said that the studio would be looking to make a sequel to Ted "as soon as possible". In January 2013, on Anderson Live, Wahlberg confirmed that a sequel was in the works and that it would be the first sequel in his career, while also revealing that he and Ted would appear at the 85th Academy Awards. 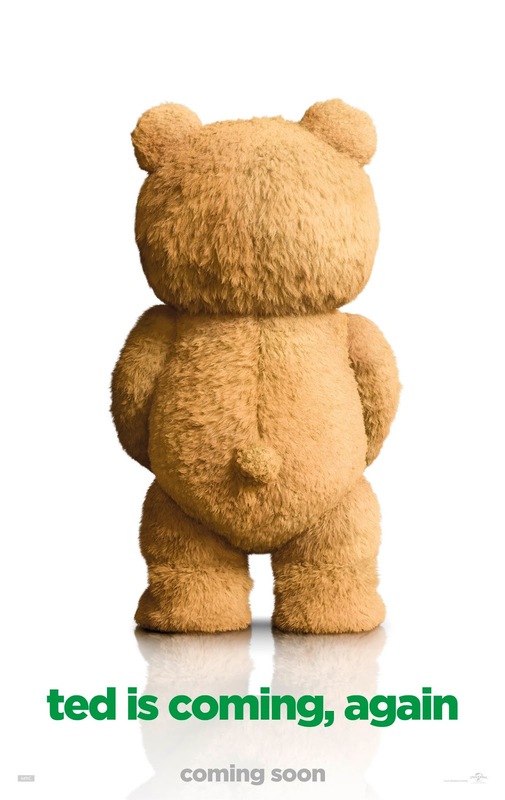 On October 2, 2013, it was announced Ted 2 would be released on June 26, 2015. On February 14, 2014, Amanda Seyfried was cast as the female lead. On June 17, 2014, Jessica Barth was confirmed to reprise her role as Tami-Lynn. In August and September of 2014, it was announced that Patrick Warburton would return, and that Morgan Freeman, Nana Visitor, Michael Dorn, Dennis Haysbert, Liam Neeson and John Slattery had joined the cast. Principal photography began on July 28, 2014, and ended on November 13, 2014. The film stars Mark Wahlberg and MacFarlane as the title character, both reprising their roles from the original film. As well as Amanda Seyfried, Jessica Barth, Giovanni Ribisi and Morgan Freeman. The cast gave hilarious performances that made me crack up laughing in the theater. Despite the absolute hilarity, I felt Wahlberg and MacFarlane's performances were stale and unoriginal in some moments in the film. However, they are still impossible to dislike. It can't be said that Ted 2 is no better or worse than its predecessor. It's somewhere in between. It dishes up much of the graphic humor and some of the insight that made the first film a hit. But might seem funnier had there been no original. It is amusing but sloppy and overcomplicated at times. However, it's the kind of movie where you start out snickering in spite of yourself, and end up actually admiring the originality that went into creating this thoughtful comedy about civil rights and what exactly defines a person to be a person. Also, the spoofs and parodies all the more make it a genuine pleasure. In the end, the film is a skillful clone of the first film that can't match that one's novelty or excitement. Within the trivial, ingratiating scope of its ambition, though, the sequel is pleasant enough. Less compelling than the first, but fun for fans. Also, see my reviews of A Million Ways to Die in the West and Ted.